Elected parish councils were first established in the Local Government Act 1894 to reinvigorate local communities and give them a voice. Previously meetings would have been held in the vestry of the local church. For a variety of reasons, including a general movement towards greater ‘democracy’ a Bill was promoted to create Parish Councils. After a difficult passage through parliament and many amendments, this Bill became an Act in 1894. Its effect was to transfer all non-religious functions from the church to the elected Parish Councils. The origins of parish councils date back to the Tudor period (between 1485 and 1603). With the decline of the feudal institutions and the dissolution of the monasteries, England needed new organisations to carry out local functions, such as looking after the poor and keeping the local roads in good condition (until the dissolution Eye came under the remit of Peterborough Cathedral). England was divided into individual parishes and all people had to regularly attend their local church. They were run by people who could read, write and keep accounts. The Church already collected income by levying tithes, (a tenth of the produce of land and stock, usually in-kind,) and a rate (property tax) to pay for the church buildings. The structure of these parishes meant they were seen as a suitable replacement. So Parliament imposed duties on the parishes. It made them responsible for collecting voluntary monies to look after the poor in 1536; registering baptisms, marriages and burials in 1538 and for maintaining the highways within their boundaries in 1555. In 1601, after several acts about the poor, Parliament made each parish fully responsible for looking after the poor of their parish and allowed parishes to levy a rate to fund this. These duties would remain largely unchanged until the nineteenth century and the Local Government Act in 1894. The local papers had been reporting on the Local Government Act since it had passed through Parliament in March 1894. In Eye, a preliminary meeting was held in the New Room* on Wednesday 28 November 1894. The time and date of the parish council set by central government: “On Tuesday, December 4, not earlier than 6 pm in every parish containing more than 300 inhabitants, the first parish council meeting will be held. Candidates must be nominated in writing, they must not be bankrupt or convicted of a crime within five years and not hold any paid office under the authority of the council. 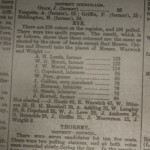 So Eye’s Parish Council meeting was held on Tuesday 4 December 1894 for the election of the first Parish Councillors. “There were present about 150 electors and Mr. J. Yates was appointed chairman. 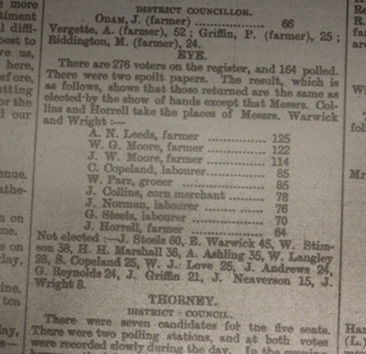 Twenty-two were nominated for nine seats, and the show of hands declared Messrs A. N. Leeds (highest number of votes), W. G. Moore, J. W. Moore (labourer), W. Parr, G. Steels(labourer), C. Copeland(labourer), J.Norman (labourer), E. Warwick and J. T. Steels to be selected, but a poll was demanded.” So although well meaning in the show of hands it was deemed necessary to hold a proper poll. The first meeting of the assembled parish council was held on Monday 7 January 1895. * The New Room is what we now know as the Leeds Hall. ** ‘Messrs’ was used before the names of two or more people, usually in the title of a company.